The Hinkley Plantation designer pineaple wall light and shade, finished in pearl bronze, a quality designer light with stunning classic features, supplied by Elstead Lighting and designed by Hinkley. Immense detail has been captured within this wall light from the cast detail on the mount through to the curved plumes on the lamp holder and the upper finial. The tapered ivory fabric lamp shade houses the lamp causing it to glow, whilst bright light is emited through the top and bottom. 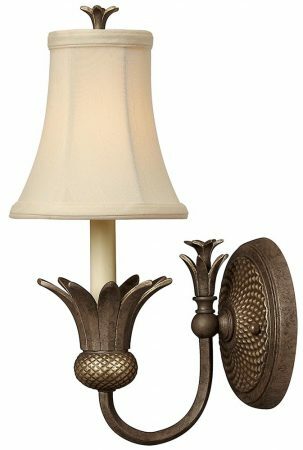 Finished in a pearl bronze, this stunning wall lamp will look fantastic in a period living room, dining room or entrance hallway creating the traditional welcoming theme for which the pineapple has become known. This elaborate and elegant wall light is designed in the USA by Hinkley Lighting, founded in 1922 in Cleveland, Ohio. They have transformed from a small outdoor lantern company to a global brand intent on bringing you the best in style, quality and value, such as the Hinkley Plantation light you see here. Their long heritage combines with a pursuit of innovative design to create modern and contemporary lighting to illuminate what you treasure most.